Swing presses for different working surfaces | YOW! During the transfer process, a certain transfer medium is pressed onto a transfer object under heat and pressure, often onto textiles such as T-shirts. 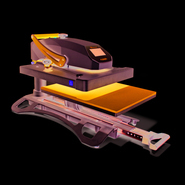 Possible transfer media include flock or flex films. The new and optimized vibratory presses from YOW! offer comfortable and flexible working conditions and are versatile, making them suitable for all known hot transfer processes. An automatic oscillating mechanism, exchangeable heating and base plates and simplified positioning of transfer objects are just a few of the advantages of oscillating presses in addition to a generous working surface. 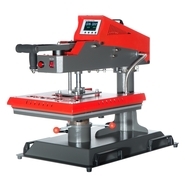 Some oscillating presses also offer particularly innovative performance and feature digital time, temperature and pressure displays, programmable contact pressure parameters, touch screen technology and much more. Let our professional oscillating presses inspire you!